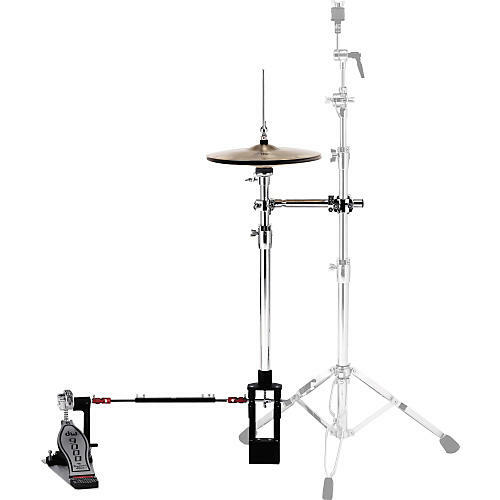 The DW 9550 Universal Remote Hi-Hat System is equipped with DW's Universal Linkage Assembly and high-tech Ball Bearing Hinge. Works as a multi-position primary hi-hat or a versatile auxiliary hi-hat for secondary hat sounds and effects cymbals. The Lateral Cymbal Seat allows instant access for adjusting the bottom cymbal angle; a small detail that makes a big difference. All the heavy-duty 9000 Series features are standard: heavy-gauge steel tubing, integrated vise memory lock, and lateral cymbal seat adjustment. The 9550 comes complete with auxiliary pedal, MG1 and MG2 mounting clamps, and Universal Linkage with 2 extension options (stand shown sold separately).